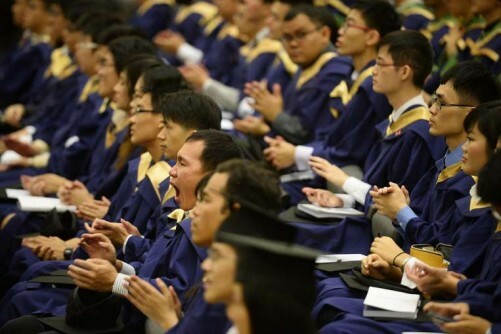 Yesterday, NUS placed 17th in the world for turning out employable graduates, up from 39th last year. Nanyang Technological University was 117th among 150 institutions. Into its fifth year, the Global Employability University Ranking is designed and commissioned by French human resource consulting agency Emerging and carried out by German market research firm Trendence. The survey was conducted with over 2,200 recruiters from 21 countries, including Singapore, who were asked to vote for the universities that were producing the best "ready-for-work" graduates. Harvard University displaced the University of Cambridge at the top. The highest-ranked Asian university was Japan's University of Tokyo in 12th place. NUS deputy president (Academic Affairs) and provost Tan Eng Chye said he was delighted by this recognition of NUS graduates. He said the curriculum for degrees is developed closely with local and global industry leaders. Students in every faculty are encouraged to intern with top companies in Singapore and overseas or study abroad through the NUS Overseas Colleges programme in six business hubs around the world, including Silicon Valley and New York. "This is a strong affirmation of the quality of NUS graduates and the university's focus on producing "future-ready" graduates," said Professor Tan, stressing that the fast-changing nature of knowledge and information made it important that students are agile and adaptable. He said: "Through a holistic combination of local and overseas experiential programmes, enhanced general education curriculum and personalised career advising, we equip our students with the knowledge, skills and ability to approach ideas and issues in creative, thoughtful and multidisciplinary approaches." The graduate employment survey for last year's NUS class showed it enjoyed a higher median salary than earlier cohorts. The median gross monthly salary of fresh NUS graduates in full-time permanent employment was $3,200 last year, compared with $3,000 for 2013. Close to nine in 10 found jobs within six months of graduation. The top 150 list is dominated by US institutions, which claim seven of the top 10 spots and 39 places in the overall top 150.